Each year, our elementary school conducts a Thanksgiving pageant. It’s a lovely time and highly predictable. Kindergarteners sing while doing sign language. First and 2nd graders sing charming songs of gratitude. The 3rd grade performs a play of the original Thanksgiving Day and the 4th grade does a waltz. There is an all-school potluck afterwards. If you’ve been attending our school since kindergarten, by the time your child enters 4th grade, you’ll have done this 5 times. Bound inside of this repetitive performance is a surplus of childhood anticipation and comfort. The anticipation flows from knowing that one day they’ll get to waltz and the comfort lies in knowing what will be expected of them and how the performance will flow. I’ve blogged on this topic often. I’ve called it structured framework, routine, discipline or family tradition but it’s always come from me – a person who thrives on change and variety. The reality is that the performance is never the same. The 3rd grade King James this year was just as brilliant as last year’s performer but with a new personality and the tissues were in the hands of a different mom. 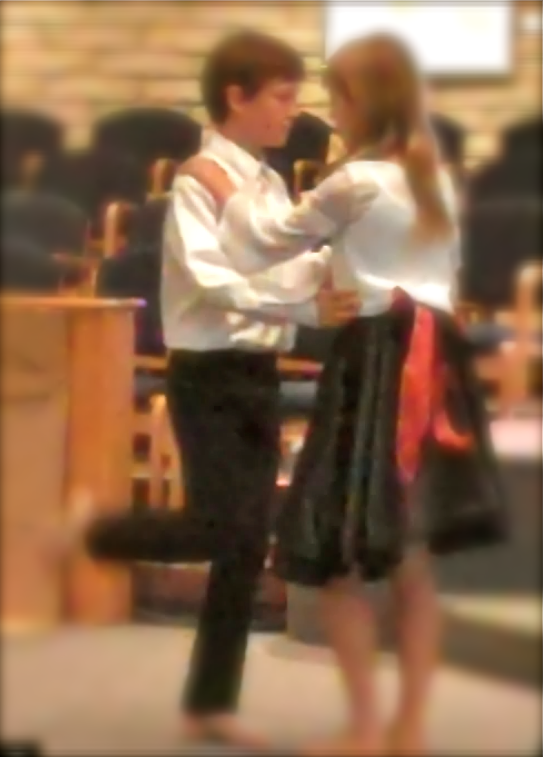 I loved the dance more than I ever have but the young man doing the box waltz had my heart in his every move. Traditions and schedules cause predictability in our lives but the repetition also creates enormous freedom in that we know what to expect and can live into that discipline. Children know this from a really young age when they begin to adhere to a regular schedule of naps and snacks and storytime. Preheat oven to 400 degrees. Put potatoes in a container and cover with approximately 3 Tbs olive oil. Cover with a tight fitting lid and shake to coat. Place into a a baking dish or tray. Add sea salt and black pepper to taste. Cover with fresh rosemary and place in oven. Roast the potatoes for about 30 minutes until crisp on the outside and tender on the inside. Shedding a few tears. Just lovely, thank you. Happy Thanksgiving! Thanks Jane. Hope you and your family have a lovely day. Love the new look Tammy! Have fun with it Jackie. Happy Thanksgiving! Happy Thanksgiving to you Tammy. May your day and year be filled with joy! Yours too Alison. So nice to hear from you. Wonderful post. Thanksgiving is my all-time favorite holiday…food, family, and friends. Yes, traditions bring normalcy to our busy lives. My kids requested their favorite foods “because we have this every year and it’s my favorite.” It makes all the cooking so much more meaningful. Happy Thanksgiving! I agree Lisa. Looking forward to seeing you. Thank you. Same to you Renee. Hope to see you in the coming year. The photo of your son waltzing is exquisite —Happy Thanksgiving Tammy! Thank you Jill. I’m betting you have a photo like that somewhere. Agreed! With our hearts and minds anchored in a few enduring beliefs we are better able to welcome and participate in the constantly changing world around us. It’s something that I want to explore further Rob. What is the exercise for causing others to decide those few beliefs and how can we lead people through that exercise? What freedom lies in knowing those things and how can we use that freedom for a greater good? Ah, I’m thinking too much – must head to the kitchen and get to work. Wonderful! Happy Thanksgiving! I’m not cooking this year so I’m planning on a really nice day! I am misty-eyed with gratitude for the opportunity to spend time with my elderly mother recreating a family tradition. Thank you, Tammy, for your post that allowed me to savor yesterday’s experience all over again. Happy Thanksgiving to you and your guys! Beautiful story Sandy and exactly what I am talking about except from an octogenarian! It works both ways and I love that. Do you have something like Thanksgiving Tandy? Drove by Chief Hosa yesterday and my heart warmed. Happy Thanksgiving to you and your family! Same to you Joan. We’ll be up there at Christmas if you’re still around. Happy Thanksgiving, Tammy. Your fingerling recipe looks so good. I love the way you wove together the gifts of tradition and ritual AND change and freedom. It also made me think of our little school’s Christmas program which will be held in early December. How that has changed and stayed the same over many years. Precious memories. The fingerlings are our go-to potluck recipe. We make them often because they are easy and because we love them. Would love to hear about your Christmas program. Ours is a sing-along! Our K-6 students (and there are 8 this year) put on a small play and then sing holiday songs as well. They try to incorporate what the kids have been learning. In the old days, when our kids attended, the last song was always “Must be Santa” and in came Santa with his bells and I always cried at the expressions on the kids’ faces. Their anticipation is real and the outcome superb. Our lunch was terrific also. Walking into your kitchen this morning, the entire family cutting, chopping, rolling and cooking was a huge joy to see and share. The smells reminded me of all kinds of sentimental jingles and the laughter and busy chatter is certainly Thanksgiving. An absolute joy and all that you share and talk about, snapped into real life. A blessing. It’s a lot of fun to get them all involved and it definitely makes it easier on me. This is so sweet…Love the photograph Tammy and of course the recipe too! Haha, potatoes are my favorite. I’ll eat them in anything. I can’t stop starring at the photo. They are so darling. I want to make a potato and eggplant dish tomorrow – Indian style. Tammy, I hope your thanksgiving was great. This post is lovely. Same to you and thank you. By the way, I adore your gravatar photo. Thanks! It’s from my wedding! Hehe. Such a ;ovely post to read, dear Tammy! I love those oven roasted rosemary potatoes too! I do it the same way! 🙂 I love your new look on your blog too, Tammy! Lovely! Thank you for the compliment Sophie. Simple roasted vegetables are often my favorite. Thank you June. It’s fun to have a long-term friendship online. I’ll check out the project and see if I can contribute. I absolutely love, Love, LOVE this post! Lately, I’ve been so focused on trying to be comfortable with the freedom of unpredictability, and reminders to live in the moment, that I never really thought about how freeing “routine” could be. You’re right, it DOES free us up to perhaps be more free in other areas. (My apologies if this reply comes to you twice. I tried sending a reply the first time around, and it looked like it didn’t go through, so I’m trying again). Thank you! I only got it once. It’s amazing how kids can teach us but also how freeing a routine can be sometimes. Blessings to you. Priceless! Kids do teaches the things that matters the most. Something we will treasure always. Beautiful post. Happy Thanksgiving. Yes, you seem to understand the kid teaching thing pretty well! I’ve just dipped a tiny toe into the blogging world, and already I’m finding wonderful new blogs and lovely people out there. Thank you! Welcome to blogging Hazel. You’ll find it can be an amazing community. My mother makes almost an identical potato dish for Christmas, adding in whole cloves of garlic and carrots or sweet potatoes. I will miss (in both meanings of the word) our traditions this year, as I will be on the other side of the world. But at least I can think, remember, and relive them. Also, I wish I knew how to waltz. Oh how I wish I was a better dancer but there is always time to learn, isn’t there Hannah? Oh Tammy, this is all so good. That photo is priceless, the recipe superb .. .and how you have me thinking about the freedom in routines. freedom in knowing what is going to be happening next, blessed me so much. I have to do a lot of routines here, and you have opened my eyes to how that is not a bad thing! Thank you for a wonderful Thanksgiving share! I first understood freedom in routine from developing a prayerful routine. Now I just need to get back into it. Beautiful blog, sweet picture and delicious recipe, one I enjoy often, potatoes are very popular in the family, especially from the garden. Hope you ahd a wonderful Thanksgiving ! Thank you Isa. It is great to relax and enjoy my family. I don’t know how I missed this earlier, but I’m glad I found it here…lovely post! Thank you Cindy. Do you have any Thanksgiving traditions? Ah, tradition, Tammy: I am rather a slave to it. I feel bereft when things are not precisely the same as they should be. Tradition anchors and comforts, it harks back to year after year when we did the same thing, it reminds us of the faces and voices of the past and makes them, in a strange way, present. I just love this post. It really was enlightening for me this year. Childhood anticipation and they worked so hard on their dance. I need to remember this. I’m a go with the flow kinda girl and there are a lot of benefits to ensuring that the flow continues in the same ways it has before. We have mashed potatoes with the meal also Camille. Roasted are our go-to for potlucks! The picture is too cute! It was graduation that really brought home tradition and ceremony for me. It was so touching to see the kindergarten (etc) teachers (who were clearly there voluntarily) watching the eighth graders walk across stage along with the families. I took the photo out of a film and then worked on it. That was fun as I hadn’t done it before. Our school is k-4 which means I need to look again for this next year. There are so many things that I want to say about this post, but I will start with… in a society where all traditions not associated with money are eschewed, I’m glad to hear someone touting the importance of tradition (and not using that tradition to disparage someone). I think I will write a reply on my blog to this. Thank you for the inspiration. Thanks for the kind words. I am increasingly bitter about commercialism of tradition. The black friday stuff sets me back and instead, I bought nothing. Kids love tradition. So true Tammy! Raised by a family that saturated its self with tradition, I ofen look to our life long traditions to ground and inspire me when I’m trying to be creative around the Holidays. Great musings on traditions! I am looking forward to what my family’s traditions will be, esp around the holidays. I have a 3 yr old and a 5 mos old and the 3 yr old is just starting to make memories and recall things so I’m hoping that certain things stick out in her mind as tradition – although this year we opted for Thanksgiving dinner at a hotel, hope that doesn’t stand out in her mind as the standard! Traditions are the most fun when they’re little and they will remember them. It’s fun to create them. “Finally! We get to do the waltz!” – love it! And what a handsome lad he is!